Last week’s December Membership Mixer was held at JPMorgan Chase and co-sponsored by Capitol Wright Distributing, LLC and Reliance Residential Realty. 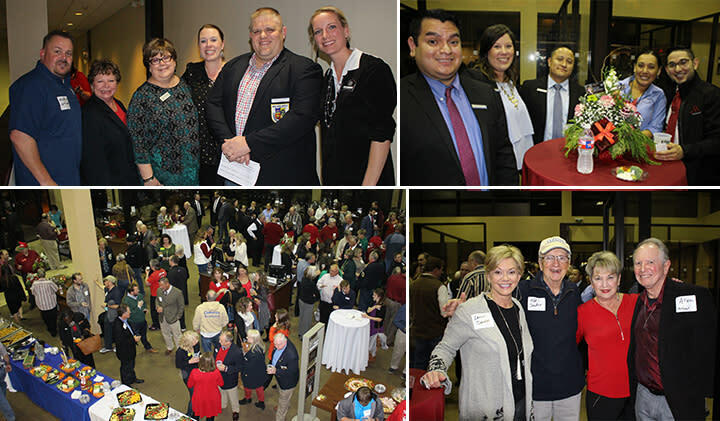 More than 200 Chamber members came out to enjoy mixing and mingling with other members while enjoying good food, great company, and some holiday cheer. The Mystery Member was Susan Wetz of Communities in Schools of South Central Texas and the 10th person to shake her hand and earn the $10 bill was Brian Morgan. The cash drawing was $100 but Tamara Wright of SERVPRO San Marcos/New Braunfels was not there to claim her cash when her name was called. That means that cash will rollover to the next mixer where we’ll draw for $150. The next Membership Mixer will be held on February 27 at Creekside Cinemas from 5:30 to 7:30 p.m. Don’t miss this chance to meet other Chamber members, network with business and community leaders, and make some new connections.